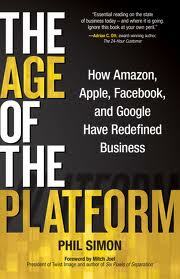 I picked up Phil Simon’s The Age of the Platform after running into his blog, and some of his writing online. Simon is an interesting guy with an obvious strong technical background. He’s also an accomplished speaker and you can find several videos of his speaking online. The first thing that struck me about this book was how it came to be. The book was funded through Kickstarter, an online platform for people to fund their creative projects. Perhaps it was Simon trying to drive home the point of his book. But it gets better, he self-published the book through Motion Publishing. Furthermore the book isn’t cheap for a paperback at $20. That said I admire that he has obviously eaten his own dog food, as the proverbial saying goes, and done it himself. The premise of the book is that we’re entering a new age exemplified by four companies, namely Google, Facebook, Amazon and Apple. He takes us through a quick history of each company, then illustrates their successes and how each of them have successfully created platforms to extend their reach. Apple did something amazing when they created the Appstore, which boosted demand for their products just a bit more each time a new app is developed for their platform. Google has strong gravitational pull with their platform by building endless free services from email to instant message and voice, to the news, maps & shopping. And let’s not forget Amazon who are putting a storefront in your hands with their Kindle, and expanding in other directions with their datacenter technologies. And last but surely not least comes Facebook, who’ve also obviously gained much by allowing third parties to build apps and extend their own platform. Simon describes these ‘platforms’ as a new economic phenomenon. I think large firms have done this in the past, such as Microsoft, Oracle or Kodak. Further one might argue car makers, with the endless variety of third party suppliers & accessories support a huge ecosystem as well. Another argument that seemed to prevail in the book is that the gang of four embrace openness and that this is something new. Certainly these four embrace openness in certain areas. But overall I would argue that they like many firms that have come before them, embrace openness when they are being disruptive to existing businesses, while they exhibit the same territorial monopolistic tendencies when they are protecting their own established business. Google has shown this in dealing with affiliates dismissively, Apple has shown this by not allowing certain apps into the app store which pose a competitive risk, Facebook exhibits this tendency when trying to export your data, profile, events or photo albums out of the service. And even Amazon has been tempted by and accused of using old economy tactics to pressure publishers for bigger discounts. Should we all jump on the platform? Simon’s premise also seems to include the idea that you and me, small business owners or sole proprietors can use these same concepts, to build our own businesses in new and exciting directions. In fact he says that we must do this or face obsolesence. Now while I admit that it is certainly important to watch trends, and not allow the changing winds of business and technology to leave us without customers or clients, it’s not at all clear to me that focusing on one thing and doing it well is a recipe for failure. The folks at 37 Signals have illustrated this so well with Basecamp. So has Chip Conley has with his chain of Joie de Vivre Hospitality hotels. Read more about his business philosophies in his great book Peak – How Great Companies Get Their Mojo from Maslow. What’s more I definitely think great companies have failed in the past by trying to innovate in areas not close to core business. So overall I think Simon has some good ideas, I think he’s stretched it a bit in trying to point out an underlying trend calling this an age of the platform. If we must call it something it’s simply the age of the Internet, the age of disruption.